I just got back from a trip to Ouray, Colorado where I was ice climbing. I have made this trip before in years past. The mountain town of Ouray has fantastic ice climbing and the Box Canyon Motel has natural hot springs on the hillside behind it. The combination makes for several great days away from the desert rock of Southern Utah. This winter we have had a real cold spell with even the ponds on the golf course behind our home freezing over for about a week. 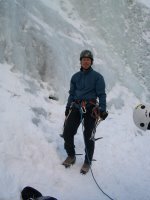 So rather than whine about the cold, it is better to embrace it and go ice climbing! Yesterday I went snow boarding up at Brian Head and then rock climbed for a couple of hours in the late afternoon in the Parowan Gap before driving home. A two sport day!